Want to hold a reunion with your classmates, teammates, club, Greek group or roommates? Contact Alumni Relations at alumnet@udel.edu for assistance with planning and promoting your next reunion! Big or small, on campus or off, reunions are a fun way to reunite with college friends, network, and show your Blue Hen spirit. Reunions range in size and location, depending on each group's preferences. Each year at Alumni Weekend, Blue Hens will find dozens of reunions hosted by colleges, affinity groups, clubs, athletics and class years. To get your reunion off the ground, contact Alumni Relations and start preparing for the fun! Click here to read a story about their event! 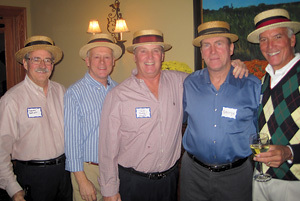 Click here to learn more about Class Reunions! Read more about this fun reunion!